One of today's most important national concerns is the projected bankruptcy of Social Security some time in the next few decades and its consequent inability to pay full benefits on time. Yet despite two decades of warnings about this, nothing is being done. The saying that Social Security is the third rail of American politics - touch it and you die - still holds true. 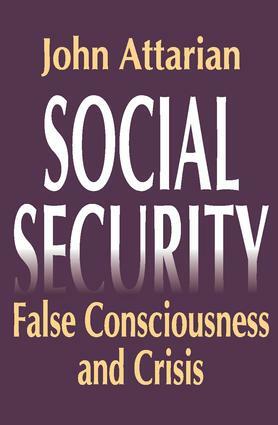 In Social Security: False Consciousness and Crisis, John Attarian argues that the major cause of the current impasse is the misleading manner in which the program has been depicted to the public and the beliefs about Social Security which prevail as a result.